Thank you all very much for your encouraging words and support for Abby and the team. During the last week of prep in Marina del Rey there were many challenges that were overcome by the team and Abby. What compounded the issues was the weather. You've all heard the song that it never rains in Southern California - it's just not true. During that last week of prep we had torrential rain every day and the barometric reading had dropped to its lowest reading on record at LAX Airport which is just down the road. Thanks to some very dedicated people, the depature was able to go ahead as scheduled. It was a fresh day in Southern CA but the sun was shinning which was a big plus. There were very light winds with a nice swell running. Our friends at the Del Rey Yacht Club were happy to host the event. A big THANK YOU to all of them. After the press conference, it was time to say our goodbyes and see Abby off. There was a nice flotilla of boats to see Abby off along with the Sheriff, Bay Watch, Coast Guard and Fire Department whose presence added to the jubilant occasion. The light winds were a little frustrating for Abby, but did allow her to settle into her routine at sea gradually. It was a proud and emotionally charged moment for me looking at my confident, young daughter take control as captain of Wild Eyes and to embark on a quest and goal that she had set herself. Having her be led out to sea by her older brother Zac, who completed his own solo circumnavigation seven months prior and becoming the youngest man and first under eighteen to solo circumnavigate the world was just awesome. Zac was very excited for Abby and was a wealth of information as they often would talk long into the night about the challenges she would be faced with. Abby settled in well to her life on the ocean, establishing a sensible sleep pattern for the different areas she was to pass, operating the equipment on board, setting up parameters on the radar and AIS, checking twice daily for weather updates and news and to report any trouble with equipment. As Abby made her way south, she encountered technical issues with some of her charging systems and some of the wind instruments were giving inconsistent readings. This was compounded by intermittent problems with other equipment. Abby, although frustrated with the issues so soon in her trip, took action, calling the various members of the technical team, performing various tests and remedied many of the problems. Numerous times before Abby left we discussed the possibility of equipment failure and issues. Although Abby had sea trialed Wild Eyes after her refit, the team would have liked to have seen extensive sea trials which time did not permit for meeting her weather windows. We knew we had the option to bring Abby into Cabo san Lucus to critique equipment, increase battery capacity, add fuel for charging, and finalize any equipment alterations that might be needed. Although having received some criticism for this, the extensive, local sea trials would not have revealed the issues that the 1350 nautical mile trip did. The technical team are second to none and should not be doubted. The trip to Cabo was incredible. As with Zac's trip, the help and generosity of locals was unbelievable. As if there had been a divine hand in it, doors would open and what would seem impossible would be taken care off. Our initial problem was getting two very large batteries along with other equipment into Cabo and through customs. Pilot, Bill Bennett offered his plane and services to fly them to Cabo but Bill did much more than that. Not only did he fly the equipment and myself in his Buccaneer, he also worked hard on Wild Eyes once we were there. We often worked 18-20 hr days. It was not easy to maintain the pace but the team worked with relentless passion to get Abby back on the ocean. Bill also took some incredible pictures which you have enjoyed here on the blog. Then there was Chris, who was renamed St. Christopher. We met Chris at the Harbor Master's office before Abby arrived keen to help. He directed us to everything we needed and took us out to meet Abby just off Cabo Falso in the 64ft Bertram that he manages. He also took us to see Abby off on her departure. His words would echo in my head, "What next, I'm here to help". He would show up at times with coffee, lunch or dinner as we plunged ourselves into the project at hand regardless of mealtimes. He also went to the top of the mast, something I personally would rather not do. He plunged in and replaced some of the problematic water ballast hoses then placed tissues under the connections to assure that they did not leak. Then there was Scott and Jeff from Team Abby Marina del Rey, solid as a rock on the technical end, who flew down and matched hour for hour. They complimented each other amazingly well as they troubleshot and carefully executed the integrated electrical repairs/upgrades. Ted from Magnetic Entertainment carefully documented all the work and interactions along with Bert Rudman from Good Morning America. The local Marina, IGY, provided a little apartment above the Marina office for Abby and I to stay in so we could be close to the boat. Their hospitality was royal and much appreciated. The Hotel Mar de Cortez provided rooms for the crew. Ted provided a rather huge chocolate cake. How he managed to come by this cake still remains a mystery!It was great to see Abby in Cabo. Although she would have much rather kept on going south, she realized the importance of her brief stay in Cabo. She was in good spirits, not fazed by what she had just accomplished or what lay ahead, but more focused than ever. There was a nice flotilla in Cabo to see Abby off, along with the port captain and local boat captains. Abby was also pleased to receive a specially crafted line for fishing from Kevin. Abby found time to conduct local radio, newspaper and TV interviews both national and international. As Abby made her way out of the harbor, a rather proud team Abby looked on from the Bertram hosted by St. Christopher. Winds were light, but for anyone that has had the pleasure of sailing in this area, Cabo Falso can whip up a stiff breeze rather quickly which is exactly what happened. Once out of the harbor, Wild Eyes went from no breeze to 15 knots and building and she took off. It took a little while for Wild Eyes to find her stride and settle into the groove. Later that afternoon, Bill and I flew out along Abby's waypoint line and found her flying along sitting in the groove. With a reef in the main sail and stay sail out and the sun setting, Bill turned the Buccaneer back to the San Jose del Cabo airport. I looked back one more time, satisfied and so excited. This was one of those rare points in life when the English language does not have words for what I was feeling. I gave thanks to my Maker and while Bill climbed to altitude to head back I was once again humbled by the generosity of so many people, the answered prayers and the commitment of the team. Would the "G'day" lead us to believ Dad is an All Black or maybe even a Wallaby? Thanks for the up-date. I was wondering if in the future there might be a paper or artical looking at or with a focus on the technical side of the trip? Do to my job I look at power systems and storage management on aircraft and would like to see how "Wild Eyes" and Abby deal with those problems. Have a Safe and wonderful trip Abby. A number of us in the deserts of Iraq are following you daily, almost like we are home. Thank you, Dad, for sharing this with us. We've had Abby's side of the story, but yours was a welcome addition. The fact that the stop at Cabo didn't affect her trip in any significant manner makes it a perfect opportunity to make needed repairs. Even if it had caused problems I think it would have been better than going on and taking unnecessary risks. Besides, who wouldn't want to to spend a few days in Cabo? Good Luck to Abby and for the whole team ! I am looking forward to following her journey. Its so unbelievable, how easily we can follow her journey daily and same time she is somewhere there, just alone. We have here in Finland winter and ice on sea. So we still have to wait a couple of months till we can jump on boat. Laurence, I was proud to be a part of Team Abby, if even for a week, flying you and the big marine batteries down to Cabo in my Bonanza. It was hard work, yet tons of fun for me to help with the additions and repairs to Wild Eyes while I was there. I have a new found respect for boat builders, especially those who design and build kevlar thoroughbreds like Wild Eyes. Abby is an extraordinary person, and it was great to meet and help her achieve her ambition. I too found Wild Eyes a magnificent sight when we flew out to sea to find her, 46 nm offshore, late on the day she departed. Abby had settled Wild Eyes on a reach toward the setting sun, had the main sail on the third reef, the stay sail up, and had her surging along, surfing the boat down the front of each wave, leaving a wake a quarter mile long. It was a sight I will never forget. Very good update, Sir. Thank you very much. I to am amazed at the selfless acts other can offer. The nature of goodness is a universal atribute some believe is lost. It isn't as you have shown. You sir are an honorable and courage father. Abby is indeed fortunate to have such dedicated support. I wish her a safe trip and an eventful one - events that will live in her memory forever! Would it be possible to put a time/date stamp on her position reports shown on Google? It would make the position indicators more informative. One smooth professional, proven and tested team leader and skipper: Abby Sunderland. One dream: to become the world's youngest solo circumnavigator. Cabo to Cabo, bonts vents! That was a very nice post, well written and explaining the problems and repairs in detail. I think many people will appreciate it, as I do. I was glad to see how much help and hospitality was available to you in your time of need. Things like that will never be forgotten. I hope she will have a smooth and enjoyable trip, and arrive home safely. Abby is always in my prayers. Wow Laurence!! What an awesome blog from you. How wonderful to hear of St Chris and Bill etc and all the locals of Cabo. It sounds like you have everything sorted and Abby can sail on confidently!! As a parent myself I can only begin to imagine what it must have been like when you had to turn that plane back to LA and out of sight of Wild Eyes...........!! Gut wrenching but proud as all the same!! Good luck Abby and may Neptune look over you and Wild Eyes. Look forward to hearing all the news as you fly through the oceans!! MJ from Brisbane. Well said, Dad! 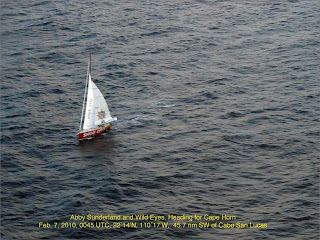 Our prayers go with Abby as she begins again, this incredible voyage. Thank you for an excellent update. For a person as me, who never has been sailing, and know nothing about sailing, this was a lesson about all the work it's behind Abby's dream. I wish Abby and Wild Eyes God speed and safe sailing. A Big Thanks for a great update!!! Also, those are Great photos!!! Thank you Lawrence for the update. What a proud father you are. Congratulations to you and your team to get Abby back on the water so quickly. Lets hope everything goes well from now on and in no time she will be sailing back into Cabo. Read the great post by Mr Sunderland. Absolutely brilliant. He sure has reason to be a proud man. I believe that with the excellent team described and with coaching from a successful circum-navigator (Zac), not to mention your drive and dedication, you will have not much difficulty in realizing your dream. I have been telling as many friends about your adventure along with Jessica's and Dilip's. You can expect more visitors to your blog soon. Do keep us updated on developments. Best wishes to you and your entire team. a wonderful account of your busy time in Cabo. Well done all of you, I can imagine what a beehive it must have been! I like that you were satisfied after seeing Abby from the plane. You, your team and all of your helpers have done all you can! Thank you for posting this... I bet your whole family is proud of Abby..I remember when your son went on the same venture. I've read a couple of books of similar 'kids' making a similar venture... I can imagine the excitement, pang, and anxiousness u have as a parent... You have passed on a love of the sea and adventure. What a legacy they will be passing on as well!. Laurence Your the Man !!!! Glad that you received so much unexpected help from the locals and other people, makes you feel good to know that there are good people out there. thanks for the update. Being a father myself I can appreciate your feelings and appreciation to all in getting Abby back out there. Very Best of Weather, Seas and Luck to Abby and her dedicated Team. Wow... now that was wonderfully written and inspiring blog post. Thanks for the update, Dad. I have no doubt that the team worked very hard. There are a few points in your post that let me worry even more. Please do not push too hard for the record, it is not worth her life. Very nicely written Laurence. Touches a chord in the heart of this sailor/Dad. R.
My heart and prayers go out to you, your family and of course Abby - may God bring peace, safe keeping and smooth sailing to all. I have silently been following the progress made by Abby so far and am still at a loss for words as she makes this trek. As a father of 2 daughters who also possess 'old souls' I am in awe of Abby at how she can tackle this feat with such determination, yet can recognize the drive – what an incredible experience for her and your family. I applaud you and your wife for raising such spirited and adventurous children who obviously learned at an early age that nothing is impossible, regardless if you are male or female and to give it their all. Abby, keep up the good work, be safe and know that there are many of us praying and rooting for you all the way. We are watching over your shoulder, encouraging you, guiding you and lifting your spirits when you need it. Thanks for the post Mr. Sunderland. I know many of us following have had, and still do have, many questions. That said, as I posted before, the team & the experts are there. Us armchair quaterbacks and weekend sailors are not. I have NO DOUBT Abby would not be allowed to restart unless all of you are confident in Abby and Wild Eyes. You have an amazing son & daughter Sir. fortunate to have a supportive Dad and great team. For Abby, Godspeed! What a professional team she has! When you think about it,it couldn't have worked out better. It is exciting to follow Abby and we are dedicated to praying for her safety and success on this adventure. But we're also praying for you, dad, and the rest of the family. Setting your child out on her own is one of the hardest things a father can do. May God keep you in His comfort and care! Thanks for the inside information of the goings on of Wild Eyes and the team behind it. And I also would like to congratulate the helpers you had at Cabo. Its easy for us not invlved to forget what goes on behind the scenes. So once again thanks to you and your team. And Abby will be better for know she has a wonderful support crew backing her up. You are a proud Daddy, you got to be proud of Abby's acheivement. I wish her success and good luck .. and read her blog everyday. I am so proud of her .. and proud of you all for sending your daughter into the world to explore. Laurence, it's always a joy to hear from you, as your skill and passion always seem to come across in your words. Both as a seaman and as a father, you've become a role model to myself and many of the parents I know. Buy "Death and Coffee" here! Guess you won't be reminding her to pick up her clothes and make her bed, but could you please remind her to get dressed before she goes on deck. Tell her to put her harness, gloves and boat shoes on! As she hit that wind line just out of Cabo, I noticed that she hadn't put her safetly harness on, and was still in street clothes. Your mate in her little pink boat from Down Under is causing quite a Ruckus. She has so many bloggers it is causing "Global Issues". So this is where you have been hiding! Great to hear things went well in Cabo. I wonder how much the extra weight will affect Wild Eyes performance. I am hoping that Abby will still be able to be a surfer girl. Gosh Laurence one could sense your love, caring and excitment for your lovely daughter in your blog this morning as well as your deep appreciation for all those who helped. Thank you for so eloquently sharing the the sea trial leg of Abby's trip with us. The last two pictures of Abby and Wild Eyes have been super. The picture of them leaving Cabo with the rails in the water and Wild Eyes showing her 'heart' (there is a heart painted around the keel...that is so cool by the way) and then seeing them so comfortably cruising at one with the Pacific. Awesome to say the least. Thank you team Abby, we are all grateful for your dedication and shall I say love for this young lady. May God continue to Bless and shed His Grace on all of you. Thank you so much for such a lovely and detailed post. I remember reading a few written by you during Zac's journey, and you remain as lively and informative as ever. To each of those mentioned in the post, thank you from all of the "armchair sailors" who are cheering from back home. You are all wonderful amazing people. I am truly moved by your selflessness and generosity. Go Abby! We are praying for your journey and your Team as each day goes by. Woodrow wilson Jr., from San Diego. What a great post. I think I can almost relate to the mixture of emotions you felt as you watched your daughter sailing away from Cabo towards her dream. She is a special young woman, and it is pretty clear to me that what they say is true, "the apple does not fall far from the tree". Not much I can do but monitor her voyage and say a little prayer now and then. She is in good Hands. Abby is living my dream! Have a safe and enjoyable experience. I really enjoy following your adventure. Laurence,....Thanks for taking the time to fill in many details from MDR to date. Details add to the experience of following your brave daughter's amazing voyage. We then have a better visualization, feeling and knowledge of what Abby is experiencing. Yours is top notch information with being closely entwined in the whole project from the start. We've now heard from Abby of course, Marianne, you, and on a no-news day in the future, it would be great to hear from Zac also. He could tell us what he was experiencing at a similiar latitude and add to the adventure. Abby,....Hope you have plenty of wind for awhile. It must be frustrating having a thoroughbred boat and be limited to trotting when galloping feels so right! Hey Dad. Thanks for the detailed and heart felt update. It is times when things aren't going according to plan that the stuff a team is made of really shines. Team Abby has done an amazing job, and by God's grace, put the right people in the right place at the right time. Thank you Lord. I know this may not mean much coming from someone several thousand miles away, but to those who jumped in to help Team Abby, thank you and God bless you. You are the answer to many prayers. Team Abby: I know we hate when things don't go as planned, but through my many years as a race car owner/driver/crew, I almost like it when things don't go well, and I am more nervous when things go TOO well. As Laurence stated many times, we cannot grow complacent. I think if things go perfectly, we become complacent, and the little glitches along the way force us to pay attention and stay on top of our game. Some of our worst races became our best performances through dedicated team effort and never quit attitudes. You all have shown tremendous skill and during this little pit stop your talents rose to the top. Well done Team Abby! Heavenly Father thank You for this opportunity for Team Abby to make the repairs and adjustments to Wild Eyes. Thank You for the willing hearts of the many that helped get Abby back on the water. I humbly ask you Father to cover Abby with your peace, comfort and protection. In Jesus' name. Amen! well, this means you are to get some extra cheering! The question does beg to be asked - is it possible the schedule is driving things ahead of safety? The qty and number of repairs sounds quite extensive. Some of us are concerned for her safety. Our prayers are with Abby. I enjoyed reading this post very much. Thank you for it. - From a stay-at-home-mom of two, and a cheering fan for Abby, in Austin, TX. Thanks 'Dad' for giving us your input from the Cabo experience. You have provided Abby with an excellent team and the experience to complete her round-the-world adventure. She is well prepared to go. God bless all of you! And not only do you have the team to provide functional and practical advice, there are a whole lot of folks out here checking her blog often, cheering her on, and praying for trouble-free, safe voyage. THANK YOU SO MUCH FOR YOUR VERY CLEAR AND CONSCISE UPDATE ON ABBY AND WILD EYES. yOU MUST BE AN AMAZING FATHER TO GO THRU NOT ONE BUT TWO ROUNDS OF CIRCUMNAVIGATION WITH YOUR AMAzING CHILDREN. (TELL ME,SERIOUSLY..DO YOU ACTUALLY GET SLEEP AT NIGHT??) SO GLAD EVERYTHING GOT FIXED. ABBY WILL DO AWESOME AS WE ALL KNOW. MAY SHE HAVE THOSE FAIR WINDS AND SAFE SAILING! Thank you for your heart felt words on the progress of 'Wild Eyes' & Abby, you are wearing your heart on your sleeve in regards to Abby setting out from Cabo san Lucas, as you know it is now or never for this great adventure, & Abby to follow in her brothers foot steps. The description of your vision of Abby & 'Wild Eyes' from the plane really left a lump in your throat and tears in your eyes when you saw how quick the groove had been achieved so early with good winds & a reef in the main. Congratulations "DAD" with the help of your wife you have raised one amazing family. with a large following wishing you all the best. I would like to ask when you post a distance from A to B you refer to MILES not NM ( Nautical Miles) as there is a difference when plotting your progress onto a map for a personal record of your path & distance traveled. Wishing you a safe passage. What is the reason for Abby sailing on a WSW course? I would expect S or SSE. She's almost 90 degrees off of the expected course. There must be a good reason. I'm guessing (since I'm not a dad) that part of that feeling is letting go of your daughter to take on such an enormous task that means the world to her at the same time. Thank you Laurence for giving us followers that definitive report. Please do it again soon. I had wondered what sort of guy would let his dear child go off on such a venture as Abby's. Now I am very proud to get to know you. Many thanks for your very informative update and well done! Irish proverb - "Children wear you out but keep you young"
I love coming on here and getting my daily fill of Abby's adventure! Thanks for the update. My daughter knew Zac from Grace and we talk about how brave Abby is to do this now!!! One night last week we were driving back from Santa Barbara and as we were along the coast we were really thinkging about her and just how amazing what she is doing alone really is!!! You are in our prayers Abby. God is good! Phil 4:6-7! You are one persistent, even-keeled, resourceful and blessed young woman. It's a special treat to be able to follow the ebb and flow of your journey. I'm glad to read you're back out at sea, and making good speed. I wish you strong winds and a safe journey. You go, grrrl! blog, thanks to dad for sharing his words so nice. Abby have a safe and fun adventure. Returning to your loving family having completed your goal! Good Luck! Wow, so young and a life full of adventure! Good luck and safe sailing! Laurence, I read, with pride, your blog about Abby's trip to date. The father of 3 daughters, I was feeling your emotion as you descibed that plane ride along Abbey's wayline as she headed out of Cabo. I look forward to seeing her updates every day! Steady winds and smooth seas Abby! This is such an amzing story! Its so nice to see young people doing something so wonderful with their lives. I wish I had chosen to do the same. It's not to late I suppose. Lol. Your children are inspirations. Good luck and good sailing!! What a wonderful blog dad. I am also a dad to a 17 year old girl who is amazing but is not doing anything as amazing as Abby. As a fellow dad I had tears in my eyes as you wrote an eloquent blog filled with obvious love and support for your daughters adventure. May God bless you and your family and I will pray for Abby's safe return. I do have one suggestion: Should you redo the "Where is Abby" map to show she is on day 3 or 4 of the trip instead of day 18? I think it would be more accurate for the record and would truly reflect how long the trip took, as the voyage down from MDR was only the shakedown cruise. I'm sure she'll do well. Safe travels - enjoy the moment - as that is all that it will be in another 30 years time!! (probably by then you'll have been around another 3 or 4 times. Well, it's all done now, and Abby is on her way. We enjoyed reading Dad's update, and getting the info on the repairs.....glad to see that you had everything you needed at the right time. Good luck, Abby. May the next six months be everything you wish it to be. As always, great writing from Laurence. Interesting that -- at least for the time being -- Jessica's blog doesn't take or display comments, even the historical ones from earlier in her trip. Seems like a real community killer, but perhaps it is a Divine Nudge to find something better to do with your life than to cheer someone on from cyberspace. Well written blog Mr. Sunderland!!! There are many wonderful people in the Cabo area... Always willing to jump right in to help with anything. I can imagine that there will be a huge crowd to receive Abby back into Cabo!! I'm hoping that my schedule allows me to be there also for her return!! So proud of her for her journey... It's hard being a 'dad' for children that have world wide dreams!! My Best to the family, the crew at home & all of Team Abby supporters... And of course, to Miss Abby!!! Not only was your blog very informative but also very emotional. Your love and commitment to Abby is obvious and I appreciate you sharing that with all of us. You and Marianne have a right to be extremely proud of Abby. And it’s so great that she has Zac to share experiences with. I’m sure that there is a mutual admiration between the two of them. I hope that you, Marianne and possibly Zac will occasionally add a comment or two. It’s great to hear from you, Laurence. Thanks much for your report. Well said, dad. Of course Abby and her team did the right thing. It may have been hard in some ways, knowing that some people would scoff or criticise, but you all know it was right. As for that "g'day" - Aussie born? or just an 'Aussiephile'? I am visiting with friends in Bucerias, Mexico just north of Puerto Vallarta. We were having dinner on the beach tonight at sunset and with the Pacific's waves crashing in front of us our thoughts were with you again sailing miles off this shore. I have just read your dad's post... and I thank you Laurence for sharing your thoughts and emotions surrounding Team Abby's activities. My congratulations to all those who made it happen at Cabo. Abby is driving a boat not a bloody ute! You are a big boy... do the math! @ Brian from Hervey Bay. P.S. At sea we use CHARTS not "maps"! Waiting for you next post for an update. How about a post a day. Maybe you like it to be of interest that not only will Abby cross the equator, but also sails "under the sun". At present, the sun is on her South, she will soon have the sun on her North. Could she, or the team, measure the time that she crosses under the sun? She may have to adjust her solar panels ! Also, at the precise time of 12 noon on that day, there will be no shade whatever, just for that moment. This kind of experience is important when you live between the tropics of Cancer and Capricorn. Would be nice to hear about it from Abby. Thanks from RB living in Cairns, Australia, on same level as Fiji and Tahity. (We have the sun to the South for 90 days every season). Amazing adventure, thanks for the updates! Great to see you back on the water again. I hope this is the last departure you have to make but as you say this was easier than the last time - I certainly you don't have to test third time lucky. From the comments in your last entry I feel you are more relaxed - and probably more confident with the aditional margins of power and other equipment. Go Girl - and stay safe. Wow, Laurence, what an action packed accounting of the events in Cabo! Better than any novel that I have read. As I eagerly await the documentary about Zac, I know the sequel about Abby will be just as exciting if not more. Godspeed to Abby! I'm speechless and have tears in my eyes after reading your Dad's blog. You have so much support, love and commitment behind you. All your team care for you so much and even the people who have only been "volunteers" such as Chris in Cabo for a very short time, they're all prepared to do what it takes to get you on your way and have safe travels. I wish you well Abby and I'm sure very quickly you will settle into a life on that big ocean with just you and Wild Eyes. Must be my age, of course I map the path & distance on my CHART. I have a name what is yours, "Anonymous said." Oh, so grand to know your back on out to sea once more. Your time there in Cabo must of been a record on repairs as such. Good deed. I think once you past Cape Horn, you can have that big CH behind you and then as its going for Jess, from Auzzie. She said it. was doing will. Good Luck and all the prayer from everywhere are with you for sure. Its good to know where you always are on te chat map, then the details in your blogs. thanks alot. If you check the opening notes to Jessica's blog you will see their is some technical issues to do with her website and this is expected to be corrected shortly. The community killer as you describe it was not deliberate and all comments including historical are all safe. Splendid blog and pictures..I rate this as one of the best blogs I have ever visited..you have great imaginature and an intimate passion of expressions..thanks for sharing them..If you have time please drop in my blog and share your view..
Good luck and stay safe. Although we have been watching Jesse very closely we are very interested in your dventure an will be reading your blog each day. Safe journey and we hope you don't hit any of those heavy seas Jesse hit although I know you would take it on without a worry. Hi Abby,I'm following you all the way and reading all blogs and peoples comments. I have a question.In case there should be a hurricane in your path are you able to avoid it or do you just stay the course?I'll be waiting for your answer.I get tears in my eyes when I read your blog.may God bless you and protect you.I have never seen such courage from a 16 year old girl. Thanks for the update! You are definitely a proud father! We wish Abby the best journey ever! Can't wait to hear from her. Hope you are going to post some pictures and videos regularly. I am particularly interested in pictures of them Albertos and them Dolfens. Jessica Watson has put some of them in her blog. Pretty exciting! I am wondering if you would run into some of them bigger mammals, like them Orkens and them Wheels. Abby,....This voyage will test you on many fronts. Knowledge of the sea, knowledge of your boat, knowledge of yourself. Upon completion you will have taken a significant step towards mastering yourself. Change is part of life, even more so in an ongoing project. Jessica Watson's team is managing well towards her new home. None of her older posts and associated comments are lost. Do you think it is irresponsible as a parent to allow and encourage a child to undertake such a dangerous journey? To Abby, Zac, & family: I'm a Bible translator back from islands of Asia. We raised 3 boys on God and Adventure: solid center and radical radius. Sounds like you appreciate our Maker too, and raise kids with big horizons. Great. Praying as I track Abby and Jess on their journeys. Teaching Linguistics at Biola U in La Mirada. Thank you so much Laurence for your very personal perspective. I was extremely moved by your words. Hey there, So i found this blog and just read a few entrys, and i think what youre doing is INCREDIBLE. My name is also Abby. And my family owns a 34 foot columbia. I dont think i'd ever have what it takes to circumnavigate the world in a sailboat, but i think what you're doing is incredible. I can't even imagine being able to do such a thing ... I've always wanted to do something incredible with my life and i think at 16 everyone is looking for a chance to get out there and find something aww inspiring in the world. I just wanted to commend you on going out and living your life and doing this. i know from first hand experience that sailing a boat with two people is hard enough, doing it yourself, amazes me. I wish you all the luck on your journey from one sailing Abby to another. dad sunderland, your blog was eloquent, so informative, thank you thank you. @ Brain and @ anonymous... STOP IT,ok? @Jony the PONY...you are a riddle wrapped in an enigma! please tell us about yourself ok? you are such a trip! again, dad sunderland, you are truly a blog-master! Jess blog comments are still disabled. I hope they can sort out them computer buggies. Squash them one by one, because Jess must feel pretty lonely by now. I really envy Abby and her whole family for that matter. Love the way you all root for each other and are a big part of each others lives. I wish I could start over from scratch and strive for more. Anyway I check the blog every day and I am very proud of this young girl and all of you actually. Nice to see people living out their dreams and sharing it with the rest of us. Abby, smooth sailing, I'm the guy that bought your oranges, apples, and stuff in Cabo. I will be following your progress. Touching and well written, thoughtful posting. Laurence you and your wife are wonderful parents and your children are amazing and also lucky to have you and your guidance. We are not here to contain our children but to help them learn to fly. Abby, just flew back here to Wisconsin from Los Angeles and as our plane went out over the ocean I saw Marina Del Rey and could not help thinking that your awesome voyage began there just days earlier. Good luck and enjoy every minute of your adventure! Keep up the blogging. It's always great to hear from you. And keep up them dodgers, Jony. Thank you Lawrence, for sharing this with all us. My family prays are with Abby and all you her family. @Saltfish550 - LOL!! I agree - "Stop it boys or you will both be sent to your room!!" Flyalong Abby - hope all is going well. this reminds me of the book, dove, by robin lee graham. safe travels and enjoy your adventure and journey! With all the squid around, I thought you would have bought a book about 100 ways to cook squid, although when you're at sea alone, they become your friends. There's been a lot of talk about sea level rising, could you mark the sea level on your boat and report to us if it rises? One thing missing from your web site and the blog made by Abby's father is the name of the person that holds the record for youngest solo non stop unassisted around the world, the journey that Abbey I gather is on. The holder of the record for youngest Non Stop unassisted is held by Jesse Martin from Australia achieved in 1999 in his boat Lionheart. While Zac Sutherland and Mike Perham did solo navigate around the world they had stops and assistance. As such they cannot be compared to Jesse Martin as the Guiness Book of Records realises. It should be said that Jesse's record of youngest solo non stop unassisted is under serious threat from another Australian Jessica Watson who is nearing South Africa and has the Indian Oceon to cross before returning to Sydney, having already crossed the Pacific and rounded Cape Horn. At the speed she is doing it in she will clearly set a new speed record for anyone. Anyhow good luck Abby and I hope you now have a sound operating boat. wow. i felt the pride just reading your words. godspeed to you and you children. Abby, My family is keeping track of you and Jessica, Jessicas kind words to you were inspiring, have you contacted her? That would be pretty cool, ocean pen pals you could share your experiences at sea. We are praying for you! Memories are a lifetime! Jack and I (Karen) were very excited to hear about Abby’s solo around the world trip. We met you and your wife while living on Horner’s Corner (our boat) in Marina del Rey. Our adventures on Horner’s Corner took us down to and through the Panama Canal and eventually up to Annapolis MD. Wendy and Patrick recently stayed with us here in Florida. They updated us about your family and Abby and Zac’s solo adventures. We will be tracking Abby and keeping her in our prayers. Seh-Weet post, fantastically written and the only English mistake is basically unnoticeable - :P Kiddin', if only i could write like M.Dad.